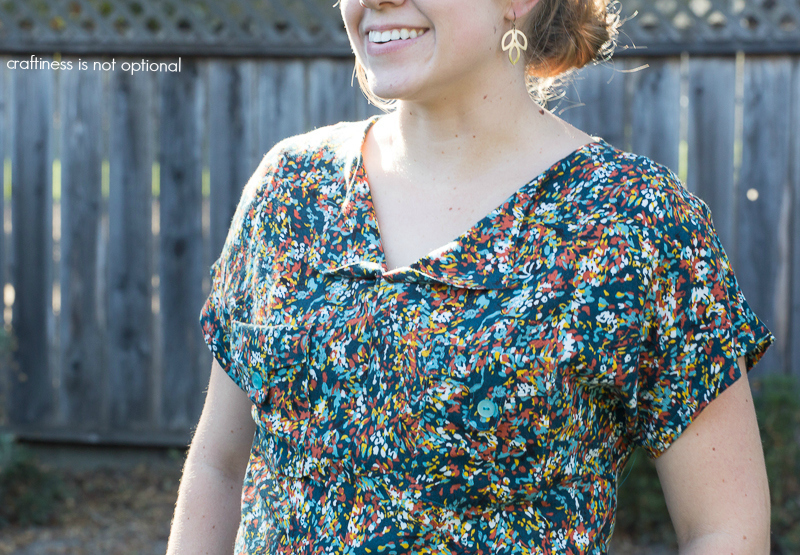 I was beyond excited when I got an email from Liesl (yes THE Liesl of Oliver and S fame), last week asking if I wanted to sew up one of their newest women’s patterns. Uhhh…ye-ah. Of course I did! 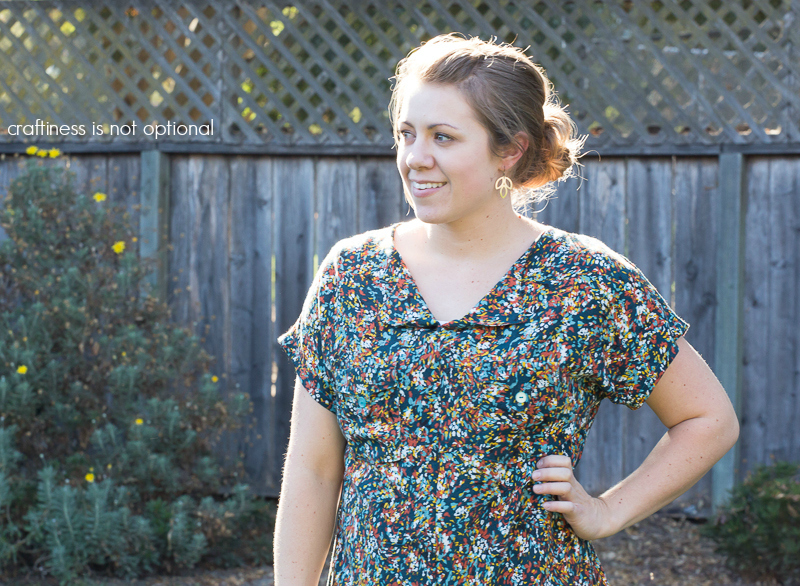 I chose to sew up the Weekend Getaway blouse, which I am sorta in love with. I used some rayon (which I can’t remember where I got-that just goes to show I need to do more selfish sewing and use up my stash!) and it drapes really nicely and is comfy as all get out. Sewing fail: I read part of the instructions wrong (chalk it up to excitement/late nights/pattern reading dyslexia) and so in these pics the front placket is wrong. It has since been fixed, of couse, but before it was fixed, the lovely Kristin was nice enough to deal with my awkward modeling get these pics of me in the top while she was visiting this past weekend (more about that in another post! ), so I used these pics anyways. I added the tabbed pockets, which you can barely see with this fabric-but I really like that little detail-it’s more noticeable in real life. I also sewed up a few more inches on the neckline, so that I could wear it without layering with a tank. The pattern itself was superb as usual and of course, I learned a few new tricks! I am looking forward to sewing up more of these tops! Get the pattern here! and check out the other just-released patterns here! I’m super excited about this pattern!! KCW, what KCW?!? Really nice! I hadn’t noticed that pattern yet. I love the interesting collar design. Thanks for sharing! it was sewing the front facings to the inside. so love this shirt. it looks great on you and that fabric is so pretty. um, a little behind here but when did you switch to wp? Love your top! I’m so excited Leisl has decided to start making women’s patterns now! 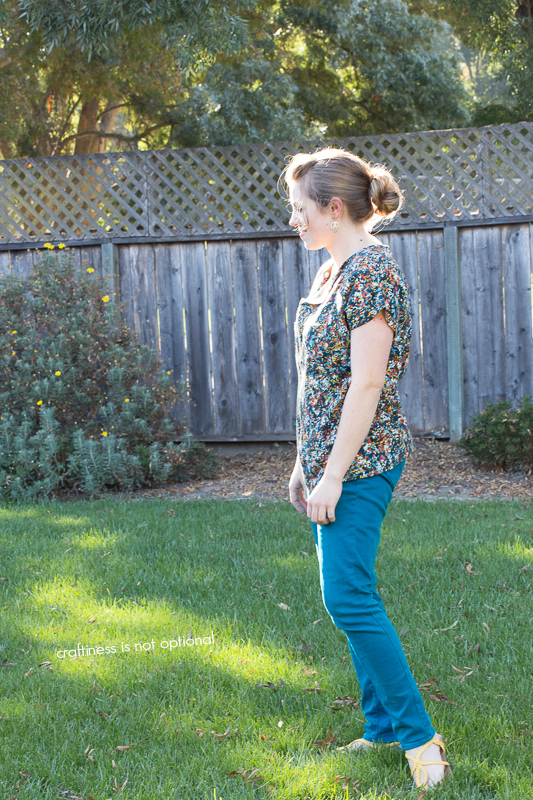 I always hear bloggers raving over the Oliver + S patterns, but I don’t have kids so I’ve never had an excuse to try one! I can’t wait to try one of these! Very pretty! That is so simple but feminine too… hmmm, maybe a Christmas wish list item for me 🙂 Nice job!